Last fall, I reviewed the Bomber gloves by REV’IT! 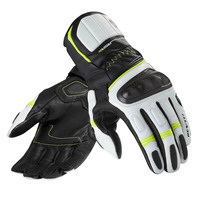 and this new RSR 2 Summer glove seems to be about the same thing but with a gauntlet. The most prominent protective feature is the hard plastic palm slider over the heel of the hand. A slider like this is almost a universal feature on race gloves nowadays. In a fall, when you put your hands out in front of you to ward off the rapidly approaching pavement, the likely point of contact will be the heel area of the hand. The slider promotes sliding along the pavement rather than a grab/twist motion that you might get with other materials (like leather covered padding). These gloves also have good looking hard molded plastic knuckle protectors. The protector has a carbon material base with clear plastic over the top so you can see the dark grey/black fibers which is sharp. And another nice protective feature is the Velcro close strap at the wrist which keeps the gloves on your hand if you have an impact.